Spray 8-inch square pan with cooking spray. Add boiling water to jelly powder in medium microwaveable bowl; stir 2 min. until completely dissolved. Add marshmallows; stir until evenly coated. Microwave on HIGH 1 min. or until marshmallows are puffed and almost melted; stir until marshmallows are completely melted and mixture is well blended. (Creamy layer will float to top.) Pour into prepared pan. Refrigerate 1 hour. Dip bottom of pan into warm water 15 sec. Loosen jelly from sides of pan with knife. 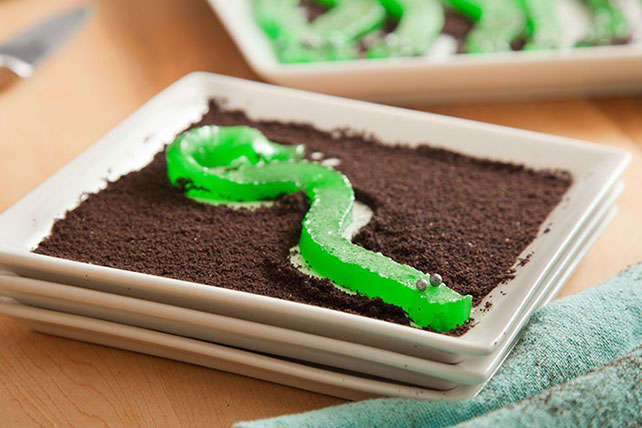 Cut jelly into 16 (1/2-inch-wide) strips to resemble worms. Insert 2 candies into one end of each worm for the eyes. Sprinkle baking crumbs onto large plate for the dirt; top with worms just before serving. For children under 4 years of age, cut worms into small bite-size pieces. Children should always be seated and supervised while eating. Prepare and refrigerate jelly mixture as directed. Cut into desired shapes with cookie cutters. Decorate as desired.